Compact borescope is designed for visual inspection of hard accessible places. 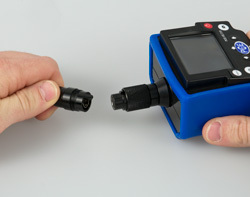 The flexible borescope head is able to transmit images directly to the LCD. Due to LED illumination the borescope transmits images of best quality even when lighting is bad. Inaccessible places can be inspected by the small camera head (5.5 mm). Image exposures can be saved directly on SD memory card. It is also possible to connect device directly to a PC via USB 2.0 interface. Due to this fact it is simple to save those images on your computer and use them over and over again. This may be in order to compare images like before-and-after-measurements. 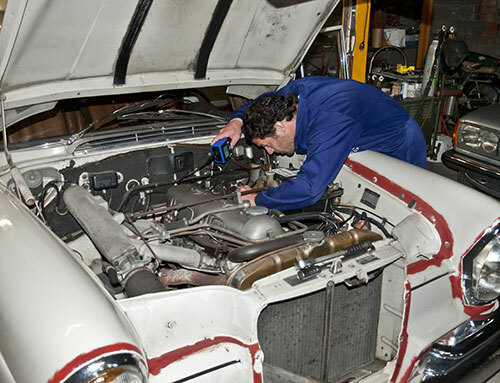 Sometimes this is also essential for different insurance purposes like damages on cars, machines or different parts. Many insurances need detailed pictures of damages especially when the question needs to be inspected whose fault it was that an accident has occurred. Again it is very helpful that the LCD displays a good image of the inaccessible parts of those machines that have been detected. The multilingual On-Screen Display ensures accurate operation. 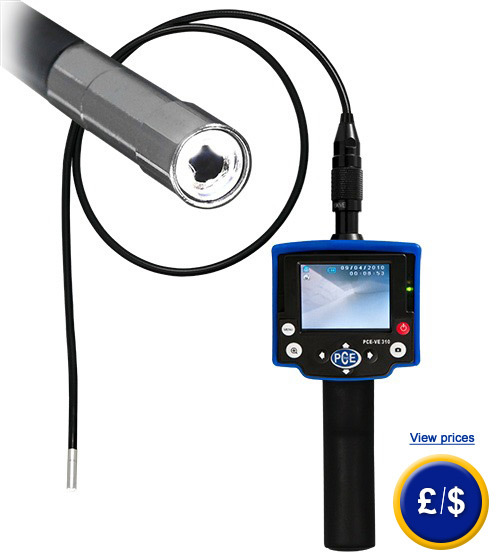 With this borescope your inspections will be performed safely and easily on the spot. It is possible to discover cavities, pipes and cable risers. 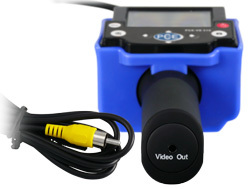 The borescope cable and camera are water resistant. This borescope has got an additional digital triple zoom. If you have any questions about these products, please contact us: UK customers +44(0) 23 809 870 30 / US customers +1-410-387-7703. An overview of all borescopes can be found here: borescopes Our technicians and engineers will be happy to help you with this borescope and all other products in the field of measuring instruments, regulation and control and scales. This 45°mirror is fixed on the borescope head and allows to see round corners so objects which are difficult to access can be inspected. Magnet attachment can be opened and used to take off little metallic materials. This attachment is fixed on the borescope head to prevent loss. Ball fixed on the borescope head can be opened. These instrumental ball makes it easier to guide the borescope tube. It minimises lens pollution.